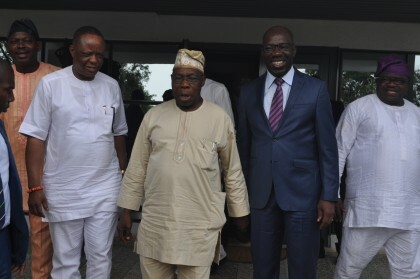 Edo State Governor, Mr. Godwin Obaseki on Tuesday received in audience, former President Olusegun Obasanjo and Billionaire businessman, Capt. Hosa Okunbor, as part of government’s efforts to create a conducive business environment in the state. A government house statement by the Chief Press Secretary, Mr. John Mayaki, said Obasanjo was in Government House to give his blessings to Governor Obaseki, his policies, and programs, especially in the area of job creation, industrialization and wealth creation. When prodded further, he said again, “I say, I come to greet Governor, I come salute Governor and Governor don pick my salute,” and laughed his way through the crowd of reporters who besieged him to extract words over his visit.